How to provide design layout with detailed workflow for customization? If you are looking for changes in design layout in the Mobile Application then it’s the easy process to achieve your desired layout for your mobile Application. As we do provide the customization service as well (a paid service). The cost will depend on your complete requirements. For the design changes in the App, you need to have the design layouts which you want to have for your Application. What are the steps to get your desired design layout for your App? 1. First of all, you need to provide the layout with complete detailed workflow by including each section and feature. 2. Based on your complete workflow and requirements, we will provide the quotation and timeline to achieve for your project/customization. 3. After the payment confirmation, the requirements will be shared with the development team and you will get your customized app as per the discussed detail. Now the step -1 is very important for your requirements that how you will send the detailed. There are many ways to provide design layout with complete workflow. Here is one example that will help you to send the design layout with workflow so that it will help both us to reduce the discussion and completion time. If the customer will click on then it will open as drawer page and the customer can see his/her account detail page if the customer is logged in. Otherwise, it will open drawer page with SignIn/Sign Up information. There will be a section in the admin panel to create this section for the App. The category image will be added by admin with assigned category ID. – Admin will create the section from admin panel. Each banner will be connected with any product or category or sub-category. When the customers will click on the banner then they will be redirected to the respective page. When the customer will click on this icon then the respective product will be added in the compare list. This section will be added by admin. Admin can choose the number of products to be shown in this section. When the customers will click on this menu then the drawer page will be opened where they can see the Category list, Language/Currency switchers, CMS page, and, Contact Us option. – Also, you need to share the design of this page. Action: When the customer will click on it then he/she will be redirected to the shopping cart page. This image will be added by admin. 3. Category Banner: This banner will be added by admin. 5. It will show that the respective product is already added into the Wishlist. 6. The respective product can be added to the Wishlist. 7. The product having the configuration options. 8. It will option the filter section (the image to be provided with filter options). 9. Product Sorting Options (the image to be provided with filter options). 10. 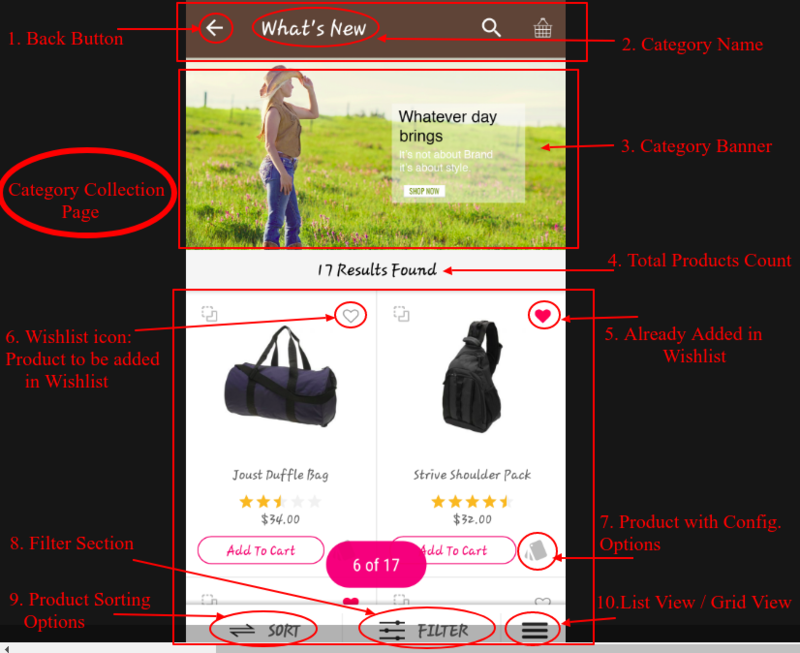 List View/Grid View: The customer can change the collection views accordingly. 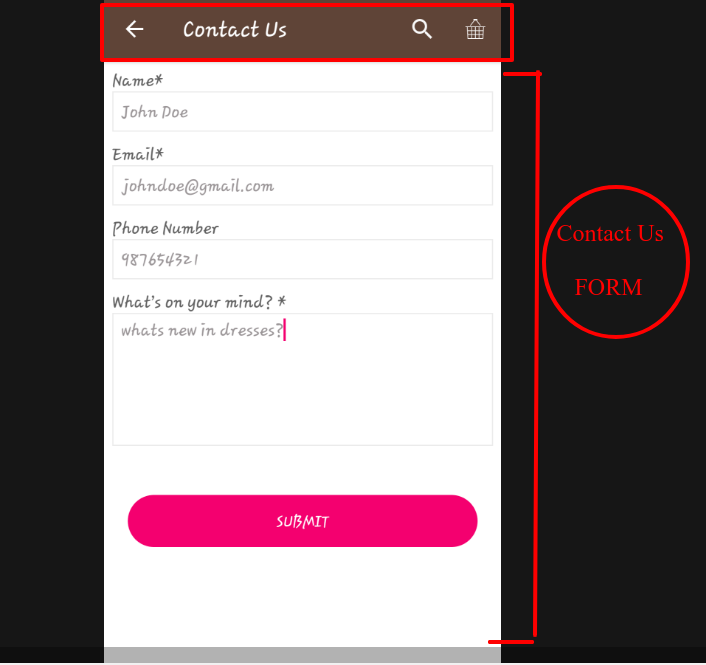 This is the Contact Us form for customers. They can contact to Admin. An email to be sent to respective email address of admin (to be provided). OR you just want to receive the emails on the person email (no database record) and queries will be managed manually. While providing the workflow, you need to mention the workflow that you want to for your app. 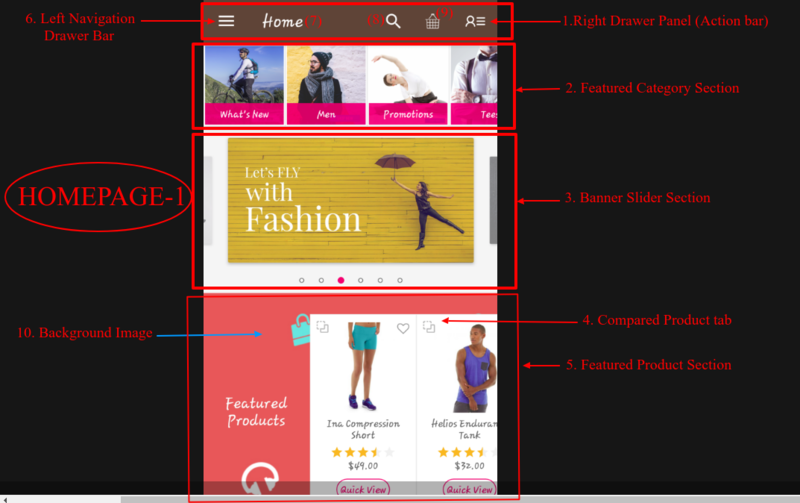 The above explanation is just an example that will help you to provide the detailed workflow with the design layout.